From the day Instagram was invented, I've always been telling myself "You can upload photos on Facebook anyway, why Instagram?" I never understood the purpose of Instagram until last year when I actually tried it. Instagram is an app that documents your life in photos. It's not just invented for vanity or for business but for sharing your world with others through photos. And it's a good medium to spread good vibes. I've seen and joined a couple of Instagram prompts online especially from Gala Darling and a few from Pinterest, and I figured, what better month to open an Instagram challenge but on February? Not only is this month about dating and relationships, it's also about you and falling in love with yourself! I admit I felt so much better trying out an Instagram challenge. I didn't post on the regular but the process of thinking about what I'm going to put up sends me into a quick meditative mood. Thinking about the prompt helps me look within as to Who I Am, and how I want the world to know ME through the photos I'm uploading. Images have a powerful way of influencing how you feel, and so this month I would like to welcome y'all to partake in this little Instagram party I call "I Love Me February". There are only three rules to this fun gimmick. 1. 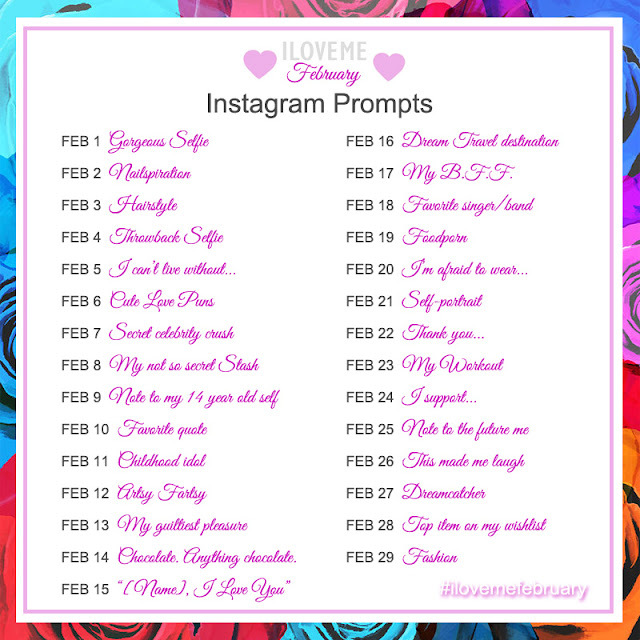 It's an Instagram challenge so try to post on the regular as much as possible but in the event that you miss a few, it's okay to keep up by typing in the caption for what day of the I Love Me February Instagram prompt is the image for. 2. Get creative. And maybe put some humor to it. I'm sure not every prompt applies to everybody but just for fun, try uploading your own version or interpretation. 3. Don't forget to use the #hashtag #ILoveMeFebruary so I can see and like your photos. At the end of the month I'll be putting up a montage of all your beautiful photos in my blog so I'm really excited for this. I hope you are too. Let's get started! Of course, we all love a good selfie and since this month is all about you, let's start with your gorgeous selfie. Get dolled up. Experiment with a new palette. Smize, girl! Nail arts are LOVE. What nail art are you currently crushing on? What's on your nails right now? Would you like to dye your hair? Try a side shave perhaps? And if you're lovin' your new do, this is the perfect time to flaunt it. They say never be ashamed of your past. Post your geekiest, most unstylish and awkward selfie from ages and be proud of it. Think about getting stranded on an island ALONE. What's the one thing you can't imagine living without? Puns are horrible but cute love puns are an exception, especially when they're in an adorable illustration. Tickle me. When we all have our own different preferences when it comes to celebrity crushes, I guess we can all agree that Zayn Malik is forever. Are you a collector of anything? Showcase your not-so-secret stash of your favorite stuff. Food is a great example. Looking back at how you were in your early teens, what would you have advised yourself? A piece of wisdom to inspire positive thinking and good vibes. Remember that band you have been obsessing with? Or a tv character you really looked up to? Be it real people or fictional ones, as long as they made a huge impact in your childhood self, post it! Get a little artsy fartsy! Feature your personal artwork or an art of your favorite artist. Either something that makes you really happy in your moments of solitude or something you really like that nobody knows about. Day 14: CHOCOLATE. ANYTHING CHOCOLATE. Why don't we dedicate Valentines' day to Chocolate? Chocolate will always be sweet, a little bitter sometimes but it will never cheat on you. Day 15: "[NAME], I LOVE YOU"
If you were to say I Love You to anyone, who would that be? It doesn't always have to involve romance, you know. Your ultimate travel wishlist. A place you've always dreamed of visiting. Fictional places are welcome. While we may not have a lot of friends, there will always be that someone who has been there with you through thick and thin. Show him/her some love. A singer/ band whose album and Spotify playlist you've been looping the whole day. You may not be obsessed with them but you know their music gets you. Could be your meal of the day, a dish you're currently craving or an entree that warms you up on the inside. Get everyone drooling. What is that one piece of wardrobe you bought just for yourself and not for anyone else to see? Something you made? Or something your crazy aunt gave you on Christmas day? I'm curious! Try and draw yourself. Cartoonize a photo of yourself. Not all of us are gifted with a good hand for drawing but this is just for fun. Enjoy! If you have to be thankful about anything or anyone in particular, this is the right time to show it. Part of loving yourself is getting fit and healthy. You can either post your favorite yoga position, your workout outfit or a good before and after photo you've worked on for some time. What's a particular advocacy that you like to show your support? In order to enable change we must spread awareness. Write a short love letter to yourself ten years from now. Remind him/her of the things you are fighting for at this moment and the things you hope she already achieved by that time. Show her some love and support. After a previous tearjerking post, let's lighten up the mood with something that made you laugh today. Part of being happy is making others happy. Spread the happy virus. Aside from shielding us from any nightmare, Dream catchers are believed to be ethereal symbols of a peaceful mind and of beauty from within. Best of all, they're really pretty. One of the most famous methods of coping with stress is shopping. What's on top of your wishlist? What's the one thing you want to have as soon as possible? Let's manifest this on Instagram. You can post here your favorite #ootd photo, or a style inspiration or basically anything that ignites the fashionista in you.